Kaytee Timothy Hay Cubes are compressed blocks of nutritious sun-cured timothy hay that are ideal as a natural treat. 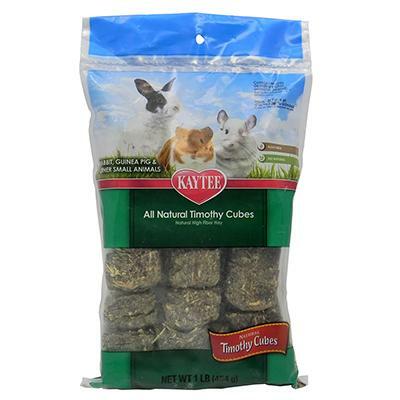 High quality hay aids the natural digestive process of rabbits by providing fiber. Because timothy hay is low in calcium it may decrease the chance of urinary tract problems. Ingredients: Sun-Cured Timothy Hay Sun-Cured Alfalfa Hay (Sufficient for Processing) Contains No Artificial Color or Preservatives.